A friend of mine shared this picture on Facebook. 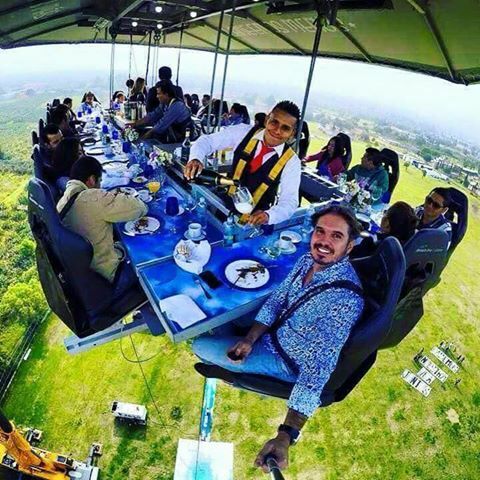 In Mexico, there is a particular food chain that serves food to people in the air. Most of my friends were commenting that they would love to have food from this place. The moment I saw the picture, I decided not to have food at this place, even if someone pays for me and treats me free of cost. I would never ever have a peaceful meal if I eat at this place. What if I drop my phone from there? It is a possibility. All of us use phone when we eat. We use it to take selfies while eating. If we are in such a place, we would surely click pictures to post on facebook and I am sure to drop my phone. The guy in this photo has used a selfie stick and he is lucky not to drop his phone. But I will. What if the food falls down? What if the spoon and the fork falls down and injures someone down below? We will be charged for murder.Who would want to be imprisoned for eating out? What if I suddenly have to pee. They won't allow me to just walk to the rest room. I can only pee from mid air. What if I have to poop? Will they provide me with diapers? In a normal hotel, I can at least run away if I do not have money to pay. But in this case, if the bill is not paid, I will have to hang there for ever. I am seriously not going there. I am also acrophobic. When I even talk with tall people, I would feel like throwing up.So if I have to sit in mid air and eat, I will end up throwing up and it will be a paint bath for people below. Same here: my mind would be mostly on the earth far below than on the food if I ever went to such a restaurant! p.s. Perhaps, as part of their publicity, the restaurant should announce - "Acrophobes, enter at your own risk" or something like that. :D What say?